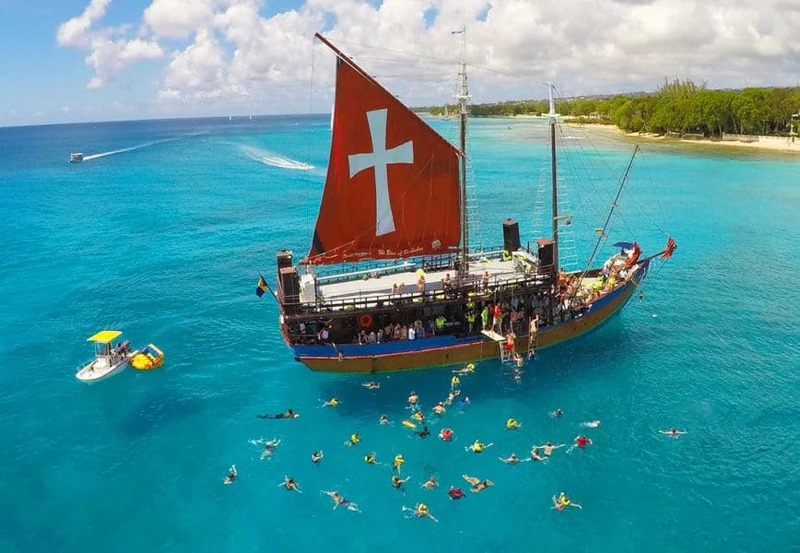 The Jolly Roger is a sailing ship that sails up the west coast of Barbados. It's famous for its on board parties. This cruise has everything the catamarans do plus rope swinging, plank walking, a fresh BBQ buffet lunch cooked to order, lots of space and shade, a top deck for sunbathing and a great party after snorkeling. salad, coleslaw, corn and garlic bread. Unlimited drinks are also included and you should try the world famous Jolly Roger Rum Punch to put you in the spirit for the pirate wedding and congaline. There are 2 swimming stops to see the many fish and sunken ships, feed the turtles and fish. Locals: Bds $140.00; Overseas $175.00; Children $90.00 (4 to 12 yo). Price includes transportation to and from your hotel.